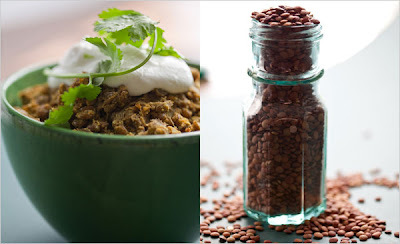 Leafy Living: Thank you "dal-ing"
Lentil Dal c/o the January 30th New York Times. The accompanying photo is silly. Why are lentils piled high in what appears to be a salt shaker? I hate stagey vignettes in print or real life. By real life, I mean in homes where the residents put a bunch of knick-knacks in an arbitrary arrangement in a corner or by a window and ta-da, consider it home decor. I consider it corny. Anyway, if the dish tastes good enough, I'll even bring a dish over to their place tonight. I'm trekking out to Brooklyn every night for the last week anyway. This is from a girl who could count on one hand how many times she visited that borough in 2008.